It took me almost 40 hours gate to gate to get from home to Vietnam. Getting dropped off at the airport we discovered that my bag was too heavy. So the trip started out right with my mother throwing an adult temper tantrum at the airport for the two hundred dollars she had to drop to get United to fly my bag to Chicago for the connection overseas. Thanks Mom. But seriously, we could have almost put my bag in a cab and had it driven to Chicago for less. The moral of the story here is that all airlines have different weight limits so if you have connections on different airlines then be careful! I also had to juggle 7 pounds out of my main suitcase and into my backpack, which was a pain. The flight to Chicago was one of the scarier ones I have experienced. During this hour-long flight we flew through 2 lightening storms. It got pretty real for me as I watched lightening shooting back and forth between the clouds out the window. Let’s just say it was an existential 60 minutes. When I landed in Chicago I was just happy to be alive. Upon arrival at O'Hare's international terminal I was forced to check my carry-on, which left me with just my small backpack. Supposedly it is a thing that when you fly to the sketchier parts of the world people break into your luggage and steal your valuables. So I had to unpack and rearrange again so that all my cameras and computer stuff were in my small back pack. I did the rest of the trip with a camera case dangling off my backpack via a pad lock. It was a 16 hour flight to Hong Kong. We flew over the North Pole and back down over Siberia and Mongolia to get there. I was told that my blood would clot on long flights like this if I didn’t take regular laps of the plane and that my feet would swell making my shoes feel tight. Neither of those things happened so interpret that as you please. 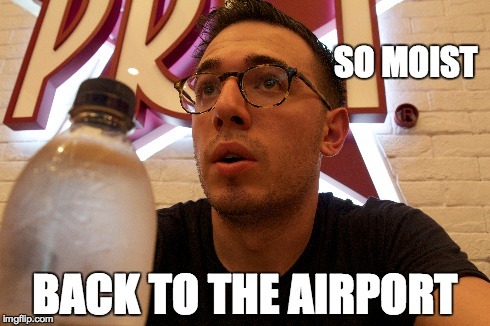 When I landed in Hong Kong it was 5:30 am local time and I had about a 12 hour layover ahead of me. I actually had to create a lesson plan and send it to my employer because I started work the next day but it didn’t take too long. Once I finished I decided to make a potentially bad decision. After 3 random Chinese people looked at my ticket and assured me I had plenty of time, I decided to leave and go to Hong Kong for the day. The problem was that I had unwittingly gone through security already. So in order to leave the airport at that point I had to go to the Cathay Pacific desk and request to be escorted out. Apparently it is bad form to go through security more than once. They were very nice about it though and showed me the way to customs. Once I got through customs (which only took about 10 minutes) it took me some meandering to find my way to the train. It as 100 HKD for a one way ticket to the city. So I hopped on and road it to the last stop. I was in Hong Kong within 25 minutes. Once I was there I took a couple hours to walk around and take pictures. It was 90 and humid so I was sweating like a sinner in church but it was still amazing. I doubt my experience did more than scratch the surface of what Hong Kong is all about but here are my observations for what they're worth. The city had an interesting dynamic. It was at least 1/3rd beautiful British people, presumably all working in the financial sector. Walking through the streets it felt like New York City crossed with the rainforest exhibit at the zoo. Also, the city is sort of at the bottom of a small mountain so everything is either up or down a steep hill. Trollies ran through some of the more flat streets like San Francisco. Interestingly, in many parts of the city there were two layers of sidewalks. The first layer was street level. It was hot, dirty and full of small Asian shops, markets and hair salons. The second level was elevated and climate controlled, unfolding like and everlasting shopping mall of jewelry stores and high-end fashion retailers. 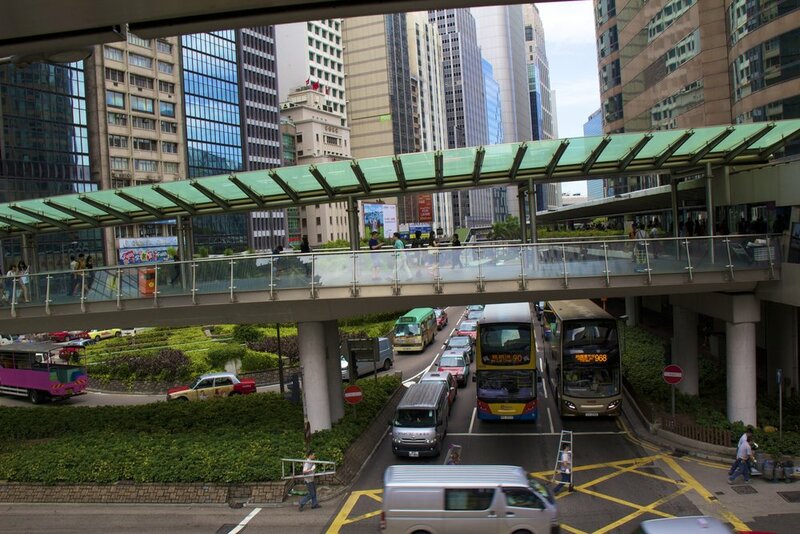 To facilitate crossing the street, these sidewalks included bridges that would arc over the busy city life immediately below. I did my best to stray from the ‘main’ roads and hiked up a series of steep winding streets with narrow sidewalks. Traffic screamed by on my right side and on my left side was a tall, grey, concrete wall. Jungle foliage seemed to spill over the top of this wall a few stories above my head. I eventually found my way up to a beautiful city park. City workers wearing the classic conical Asian hats tended to the gardens that surrounded a massive fountain in the center of the park. After some wandering I ventured back down the hill, passing a series of old churches nestled into the metropolis as I went. Finally I got sweaty enough that I returned to the upper level of the streets and stopped for a drink. A bottle of water and a cookie cost me about 20 HKD (about 2.50 USD). Then after a little more wandering I got another 100 HKD train ticket back to the airport. Total money spent on my short trip to Hong Kong: 220 HKD (about 28.40 USD). We’ll get into some more financially involved trips later hopefully. I got back with plenty of time to spare. If you ever are in the position to do a quick trip in like this, do not fear! I was through security and at my gate within an hour of getting back on the train in downtown Hong Kong. Granted, this would have been more difficult if everything were to have been at its busiest but it still would have been very doable. Below are some photos I snapped during my walk around the city.